It’s always so hard to believe another year is gone! This past year, I only had one big finish— “A New England Album,” but I kept my resolution of not adding any more UFOs to my list! So now that I have actually figured out how to finish a quilt (instead of thinking about it, you actually WORK on it) I’m feeling bullish about more finished pieces this year. 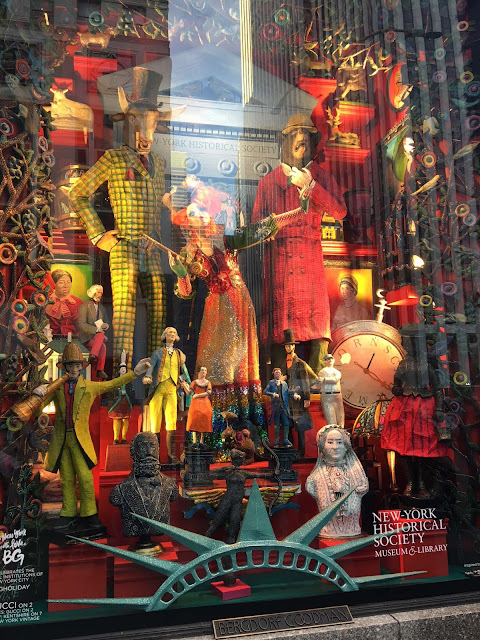 I pulled out a few UFOs from earlier years to make my Quilty Resolutions. This is for a challenge in April, and is first on my list to be finished in 2018. I’m off to a great start— I promised myself that it would be pieced by the end of the year and it is. 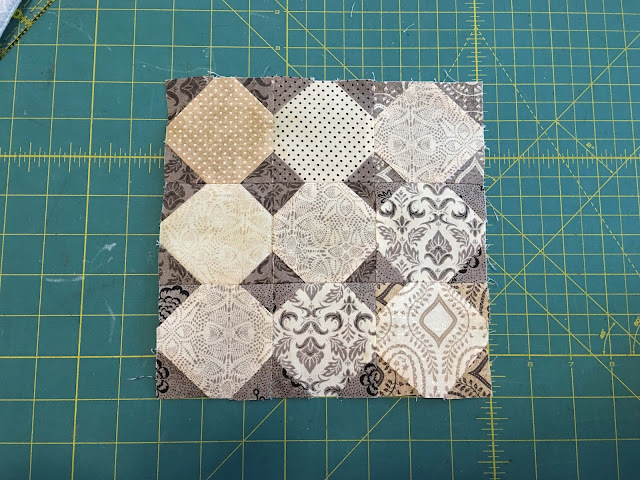 I also promised myself it would be beautifully pieced— and it is! They are the size of a nickel! 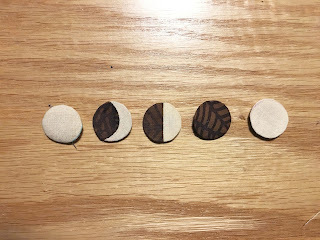 I have some really fun quilting patterns sketched including coffee bean plants, and anything and everything that is shaped like a circle— gears, the sun and moon, yin and yang and more. Sort of like a graffiti quilt. 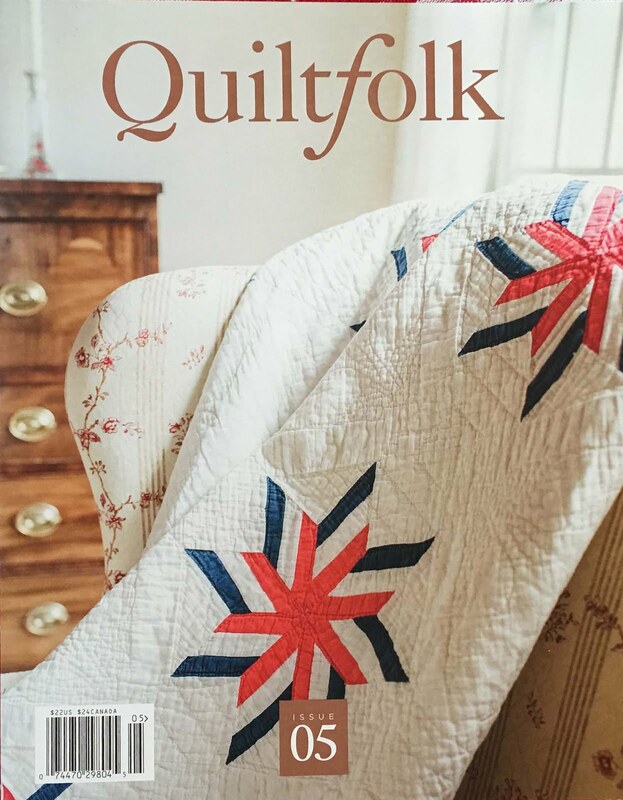 Going to start quilting as soon as I can get my hands on batting January 2nd. Hope to finish by the end of February. This, of course, is our San Francisco Stitch Co. Block of the Month for 2017, and my best hope for a show quilt next year, which now needs a ton of finishing work. Contrary to the photoshopped version on the website, this is where the real thing stands. I need to finish the setting triangles, stitch it together, and I have beautiful quilted flower borders in mind. The blocks are obviously formal bouquets, but the outside border is going to be a scene of wildflowers from up close, then faraway flower fields, right up to the sky, all around the edges. And I am piecing white on white pinwheels to embroider on. Over the top enough for you? Unlike last year, when I didn’t know how well the Baltimore borders would come out, I’m going to write instructions for these as I go along— so you’ll be able to stitch them as well. But be patient with me! It’s going to take time. 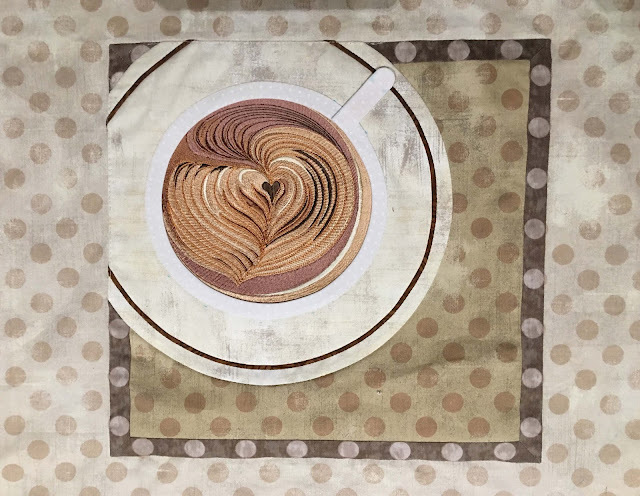 This one I’d love to have ready to show first at my home quilt guild show, Bayberry Quilters of Cape Cod, in August. I will definitely get those two quilts done this year— so then it will be time to dig into my UFO box and finish up some others. Let’s go! Here’s my wish list of four more finished in 2018. After the bouquets, I am going to want something small, fast, and fun to work on, but I will still be loving flowers, so here’s a UFO from 2016. I took a class with Laura, (google her) and it was advertised as not requiring a sewing machine. ??? Well, we didn’t, and I never had so much fun in my life. 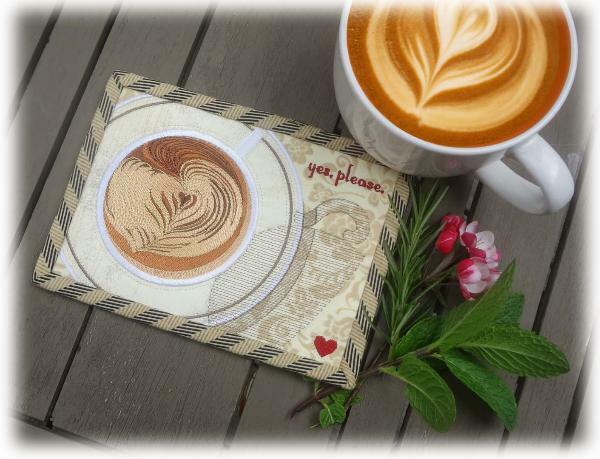 It was all free cut, fusible applique. 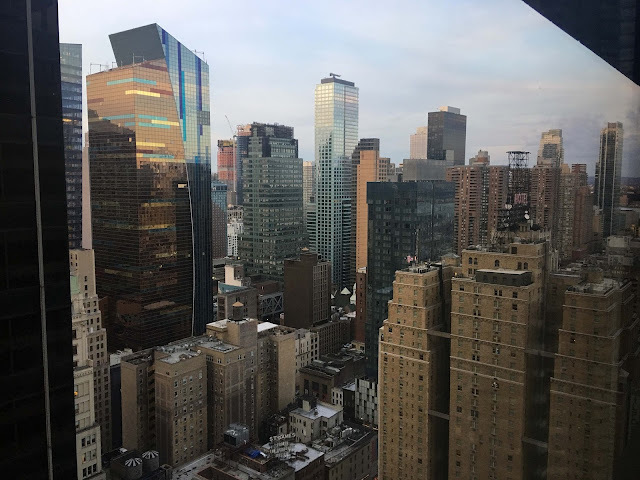 To add to the fun, my friend Tere took a dying class at MQX earlier that year— we never laughed so hard as when we were on our hands and knees, rinsing the fabric in our hotel room tub. As my reward, Tere gave me my choice of her custom fabric— and that is the fabulous, crazy background you see. Later that year, when I tried to hand embroider the flowers, that was when my rotator cuff totally separated--not because of the piece, but just general wear and tear— that was NOT FUN at all, and I put it away: there it is with the needle still in it. 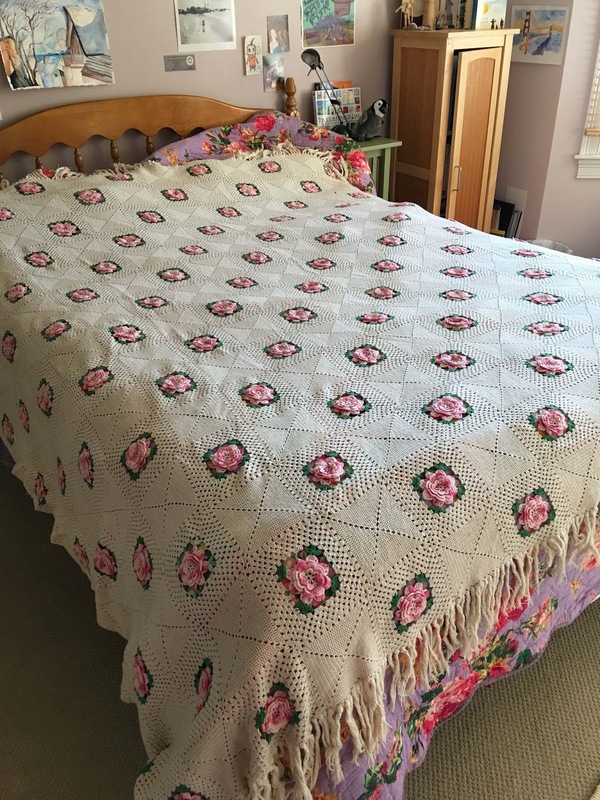 But I would totally enjoy making a flying geese border and just throwing some colorful free motion quilting on that piece. It just looks so happy to me. Should be an easy finish! This is an older piece, when years ago I had digitized a Dungeness Crab in honor of my time in San Francisco. I wanted to make a larger piece with that embroidery, which I was, and still am, so very proud of. I also wanted to make a compass star. 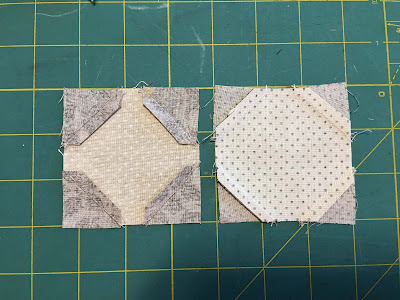 I stopped, for whatever reason, with two borders to go, and I now can’t find the fabric I was using. I still love the piece, and can just envision waves and shell quilting across the sand. Deserves to be finished! 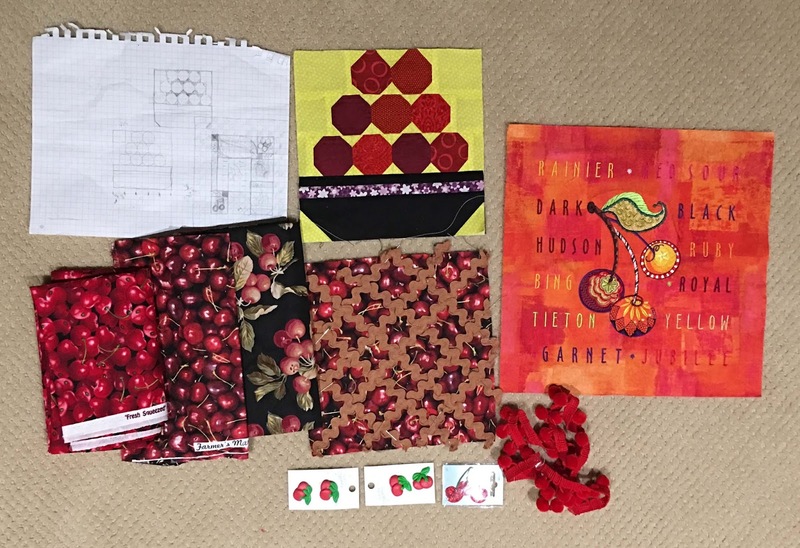 I really love zentangle drawing style, and obviously you do too, because my fruit sets always sold well (and yes, I will do more at some point this year) SO I started just making a fun, random quilt with all cherry themed ideas to match the embroidered block in the upper right. I made the bowl of cherries block, a block with ric rac that’s supposed to be the top of a pie, and the most fun of all was collecting cherry themed fabric, buttons, notions. This one has a sketch tucked in with it. 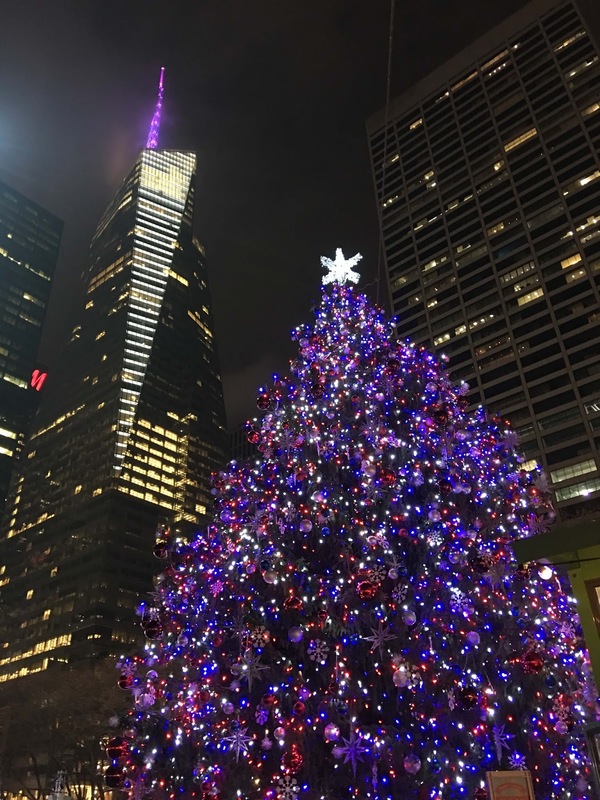 And I’d love to finish it this year. Those three pieces are all small, and very do-able... but now we’ve reached the bottom of the box and there’s something that needs a lot of work! Here’s my most GUILTY PLEASURE that I love to work on. Yes, I am a hopeless Lori Holt fan, and even though my conscience tells me I should be working on original art, this comes out from time to time. 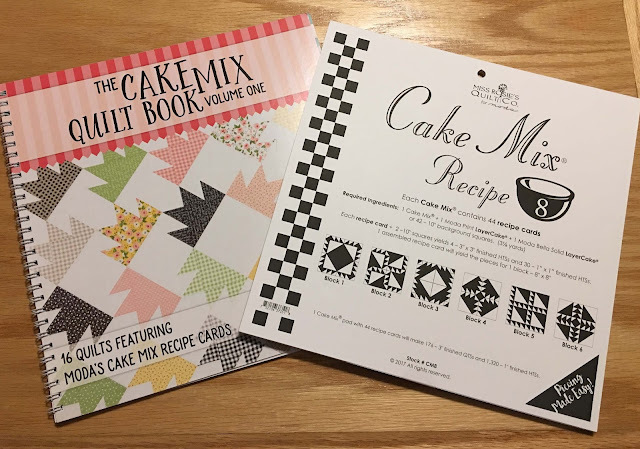 The history is, that I bought the Farm Girl Vintage book when it came out 3 or 4 years ago, and I greatly enjoyed teaching my daughter how to piece the blocks. One summer especially, we made most of these, right before she left for college. 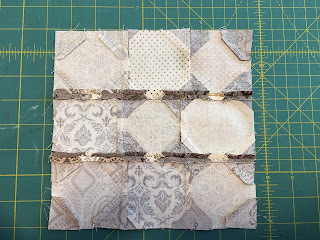 Now, I got her to the point where she was a great piecer, but as it turns out, quilting isn’t really her thing, and it took me time to “get over it,” and I put it away. So I am totally over it, but I’m on my own now— I would still LOVE to finish this for her, as a memento of a special time we spent together. It’s called OUR HOUSE because many of the blocks had special meanings for us, like the baking set and the camera. I can just see it all completely machine embroidered with tons of cute details. And just because that’s not enough work, I discovered the Chuck Nohara quilt— (google it after you google Laura Waslowski) and decided I want to finish it with tiny Xs and Os in the border, like hugs and kisses. So I'd need about 500,000 border pieces. And maybe I need more like 100 blocks for the best look! So this still has a lot of work to go, but I’d love to just advance it this year. What are your quilty resolutions? Pull out one today, and take a picture of it! You might just surprise yourself a year from now, if you actually work on it, instead of just thinking about it— and trust me, 2018 is gonna fly! 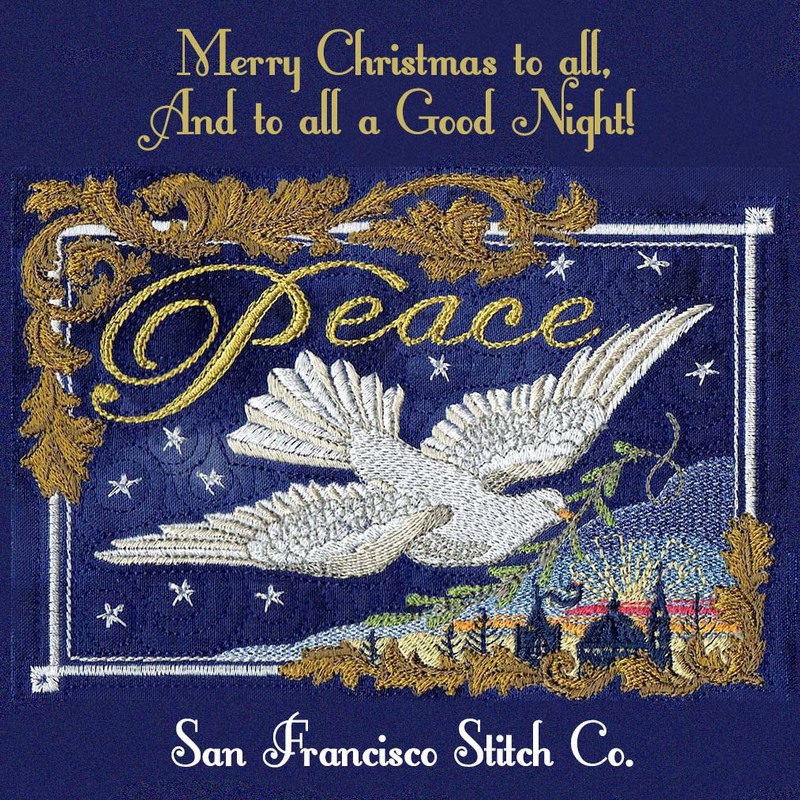 It’s been quite a year for us all at San Francisco Stitch Co! 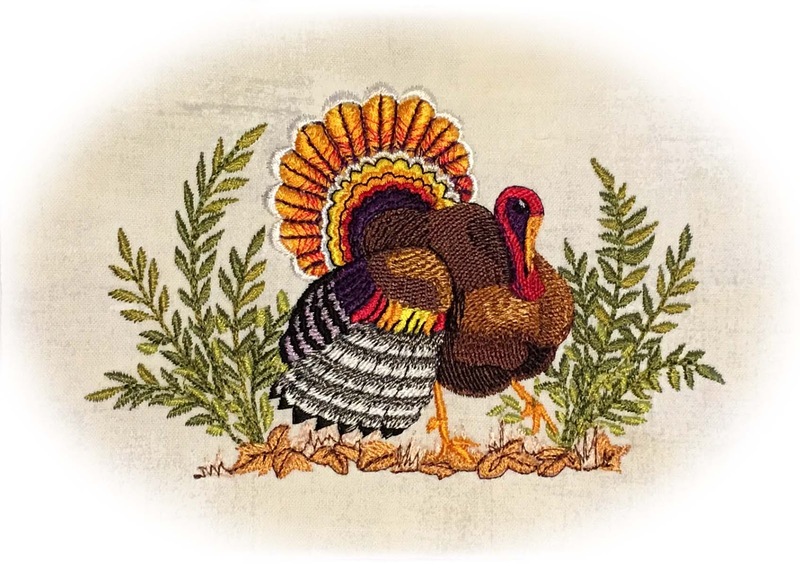 and we look forward to stitching with you again next year! Carol, Meg, John, Caroline, Steve, and all! 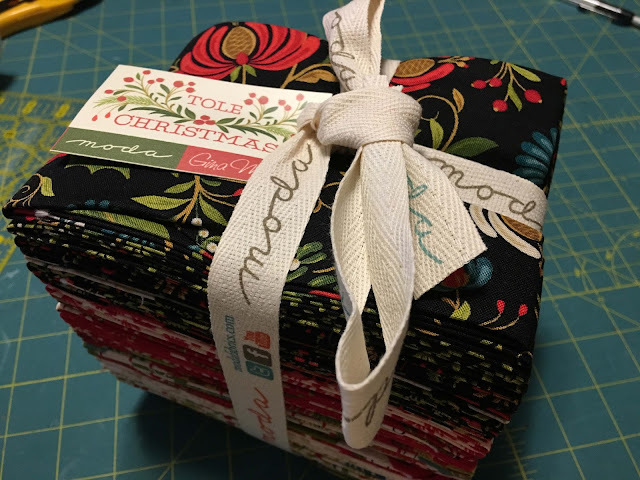 Christmas FREE Stitch-a-Long Wrap Up! This morning we posted the last of four free designs for our Christmas Stitch-a-Long! We hope you kept up, and not only downloaded them all for free, but also made the time for a little embroidery in between everything else you have to do. I'm sure I speak for a lot of us when I say I'm starting to feel a little stressy. So much left to do before the 25th! The powers that be are trying to drag me out of the office, away from the sewing machines and out into the hubbub... employees are looking for time off (what?!!) and to be honest, I am really starting to need a break myself. Then tonight I am in Boston and tomorrow night in New York... sounds pretty glamorous, (read: exhausting) doesn't it! So for the Christmas Stitch-a-Long, we all decided on a QUICK finish! This is a first for San Francisco Stitch Co.-- we decided to do something easy. But it will still be beautiful. Promise. Mark the centers of your designs with an washable fabric marker and then use the centerpoint to draw a 7-1/2" x 7-1/2" square evenly around your design. 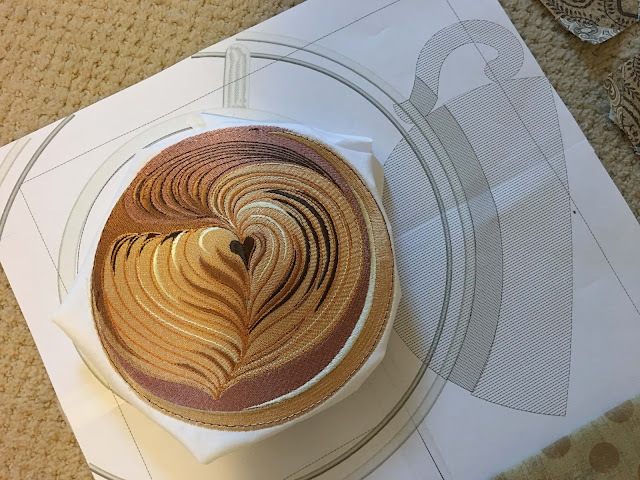 Confirm that it looks centered and then cut. 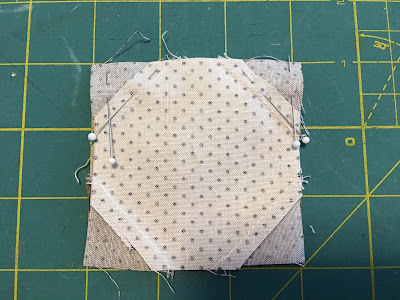 Tear or cut away excess stabilizer for a softer finished piece, if desired. You can see our blocks above, and the back of the gingerbread house design. 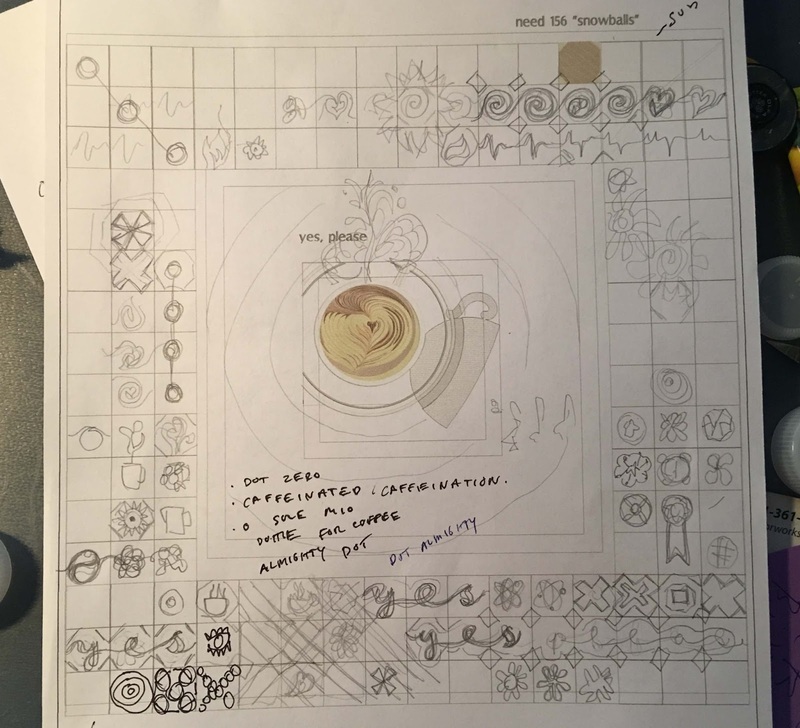 Arrange your blocks in the order that you'd like-- we're going with a horizontal format for our coffee table. 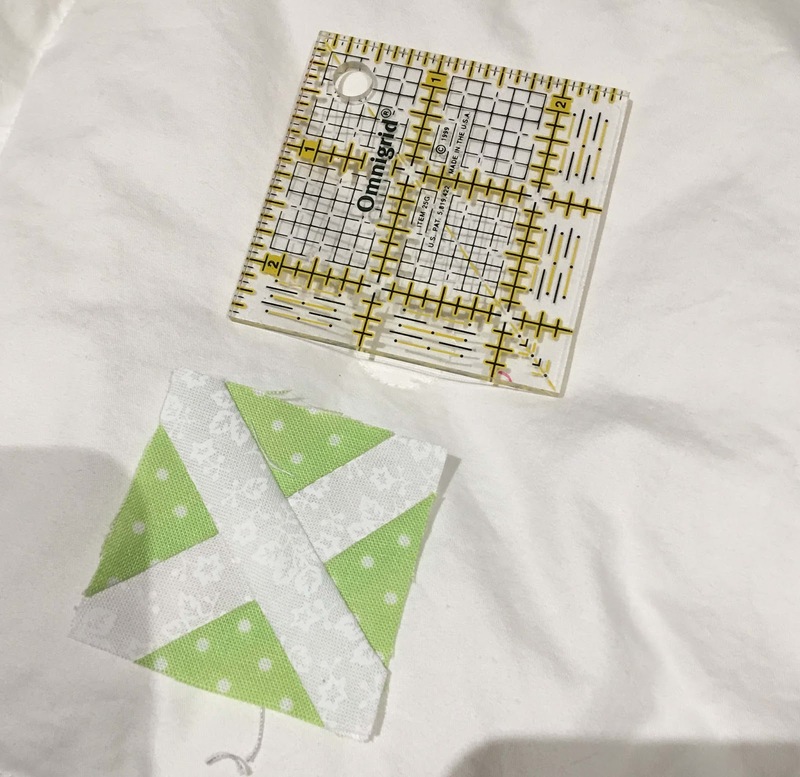 You might choose to stitch the blocks vertically for a wallhanging. (Put it on your door with the Merry Christmas block on top!) Or you could do two over two for a more square table topper. Sew them together with 1/4" seams. 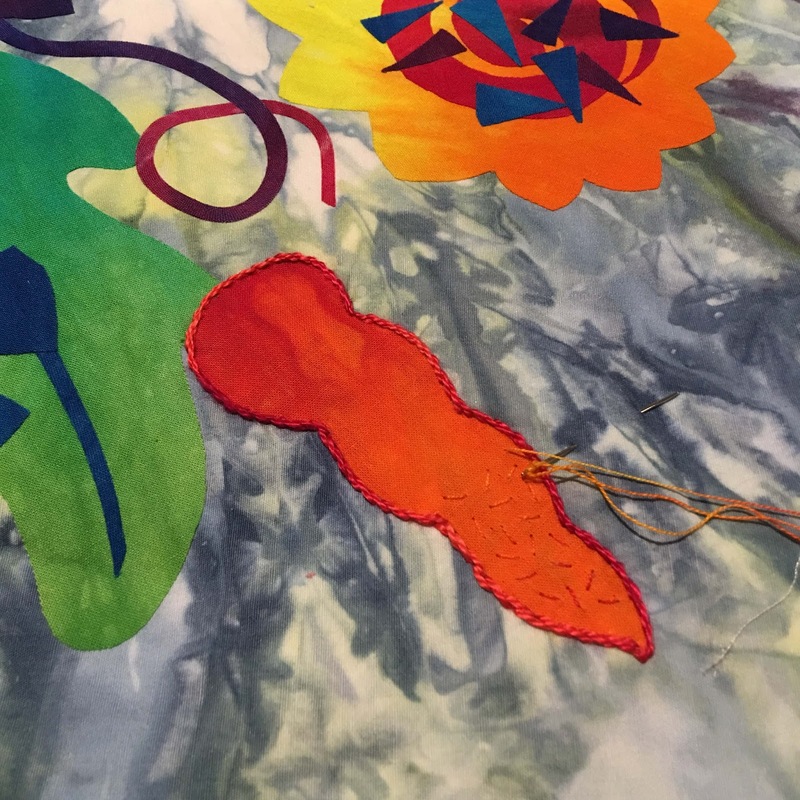 We usually press seams open when the same fabric is on both sides-- we won't be stitching in the ditch here-- we'll be free motion quilting and trying to get those seams to disappear. Cut two pieces 28-1/2" x 3-1/2" and two 3-1/2" x 7-1/2." Stitch the longer pieces to the top and bottom of your runner, and press the seams toward the embroidery. 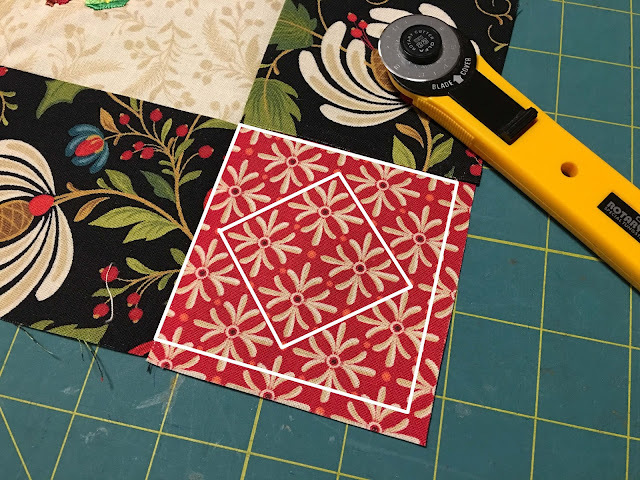 Then cut four cornerstones 3-1/2" x 3-1/2"-- we used a matching red print from the same collection. 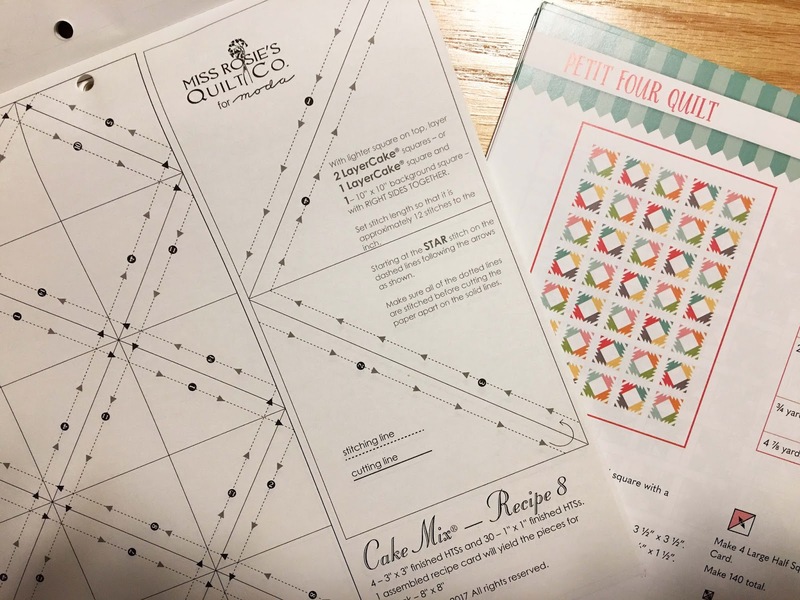 Note that "quick" does not have to mean shoddy-- instead of cutting our red fabric haphazardly, we fussy cut so that once it is bound, the design will be perfectly centered in that square as shown by the white lines. Little details like that just say "quality," and it just took an extra minute to do. ... we have a little ta-da moment... all in a little over an hour! 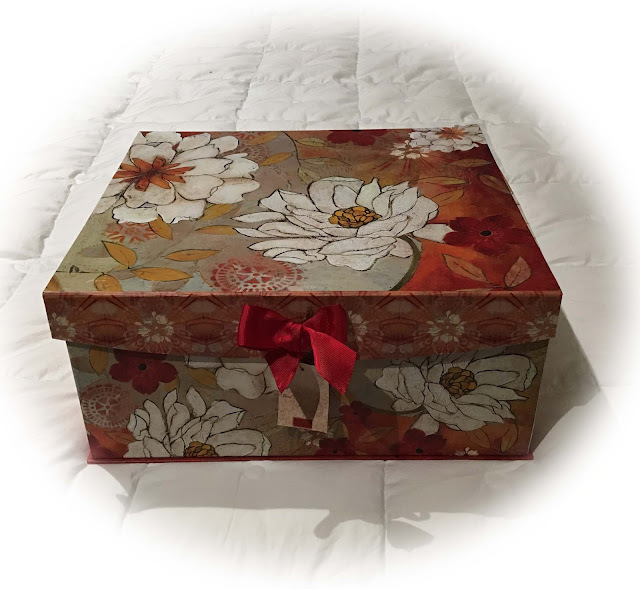 If you have time, or maybe you want to gift this, just bat and back, stitch in the ditch, bind and be done. 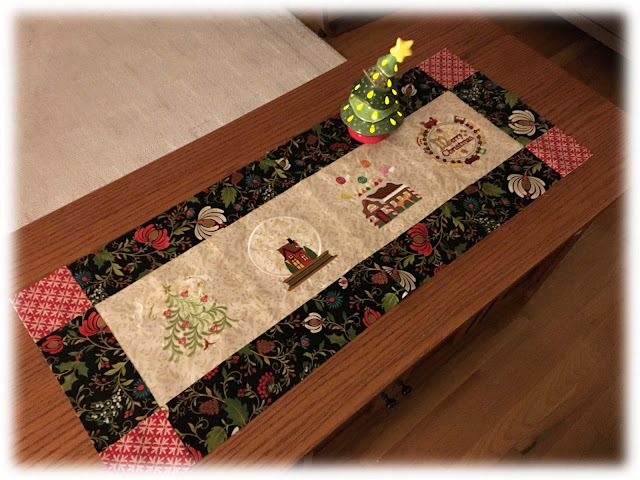 We are just putting ours on display as is for now... in those glorious quiet days between Christmas and New Year's we'll come back to it and do some more free motion quilting. We give away so many of our samples every year, but we're thinking this one's a keeper. Look... it fits the coffee table perfectly! So it's a wrap on Christmas Stitch-a-Long 2017. I have noted and appreciated that some of you still find making a PDF from this blog post difficult, so here's the compromise: if you want your table runner before Christmas, you have to use this, but if you are willing to wait, I will post a follow-up on the website, and maybe ours will even be finished by then. So like I always tell my family and friends, EVERYONE can be happy. 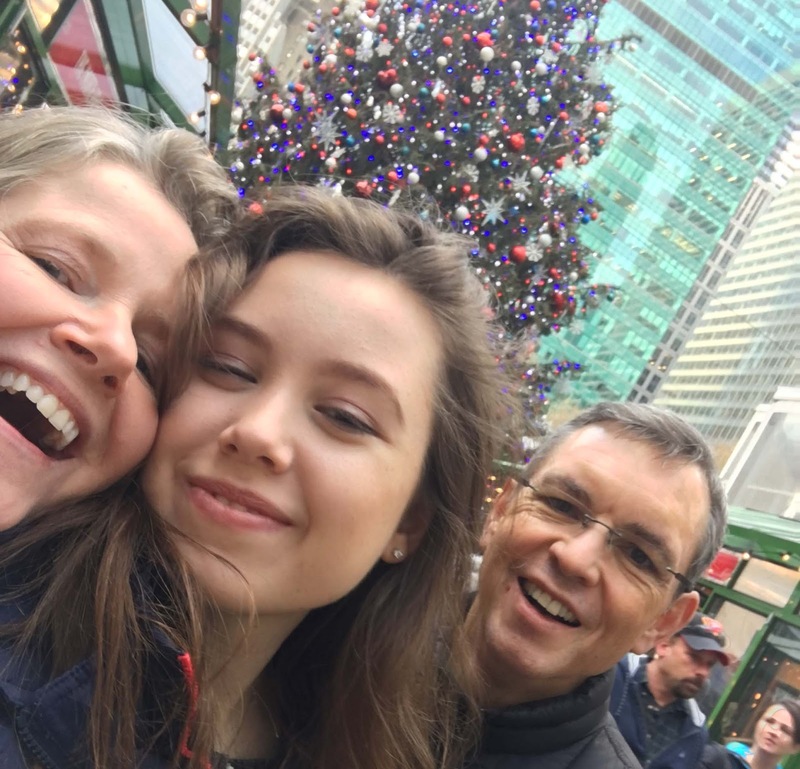 XOX. 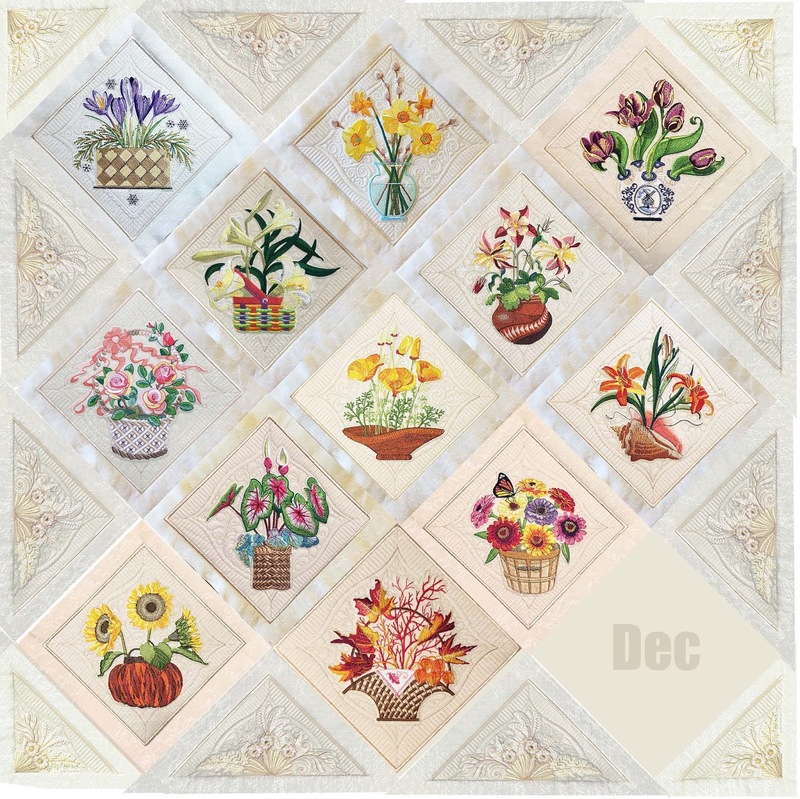 There are still lots of things on our to-do list before the end of the year, including finishing our Countdown to Christmas Advent Calendars, and the last Flower Block of the Month, so stay tuned! 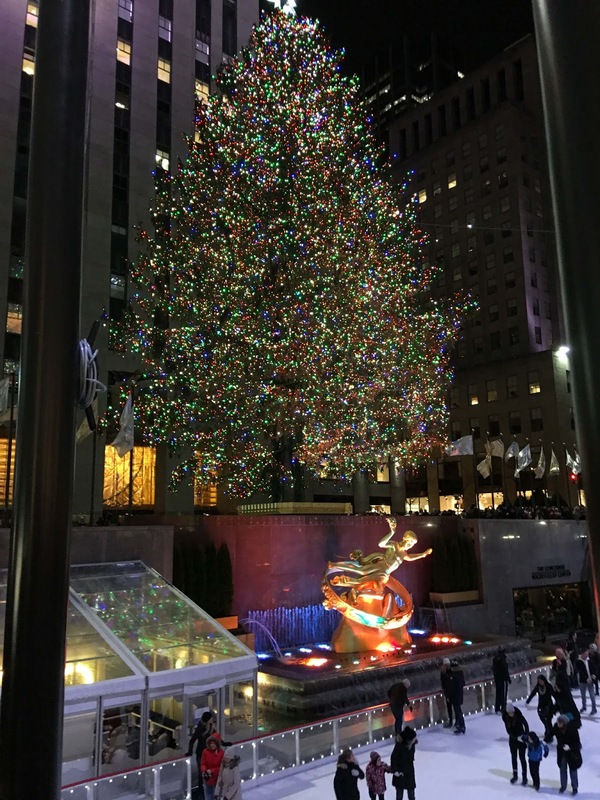 And we hope to have Christmas tree photos from Boston and NY to share. It's been three weeks since my last post, and I realized that if I don't do something soon, it will be January 1st before we know it. Business has been really hectic since Black Friday, for which I am grateful. XOX But we've all been burning the candle, so to speak, at both ends. 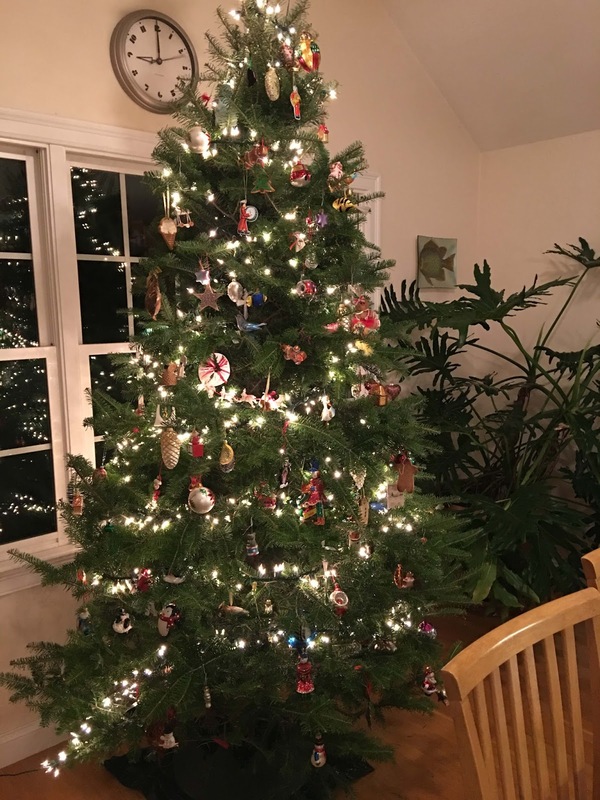 The time finally came to push away from the computer and get some decorating done... for this, I turned to my son-- he's the go to guy with the pickup truck-- everyone needs one of those in the family, especially when you need to move! My son is not at all the sentimental type, but this year he really enjoyed looking at all the ornaments and reminiscing-- I discovered that I remember where each and every one came from, even though I'm never sure where my purse is. XOX It was just the two of us, and we really enjoyed having time together. 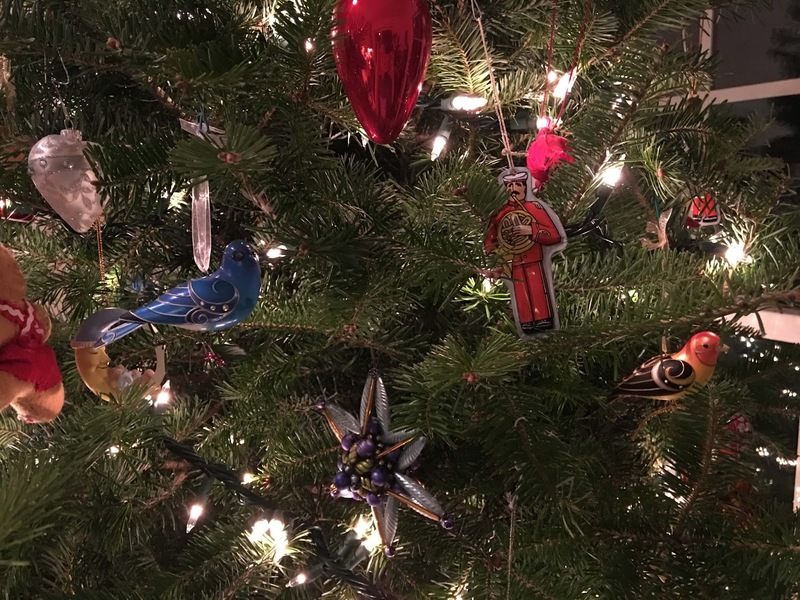 I am collecting the Hallmark "Beauty of Birds" ornaments-- I don't prefer plastic ornies as a rule, and the birds are metal-- beautifully made, and heavy. 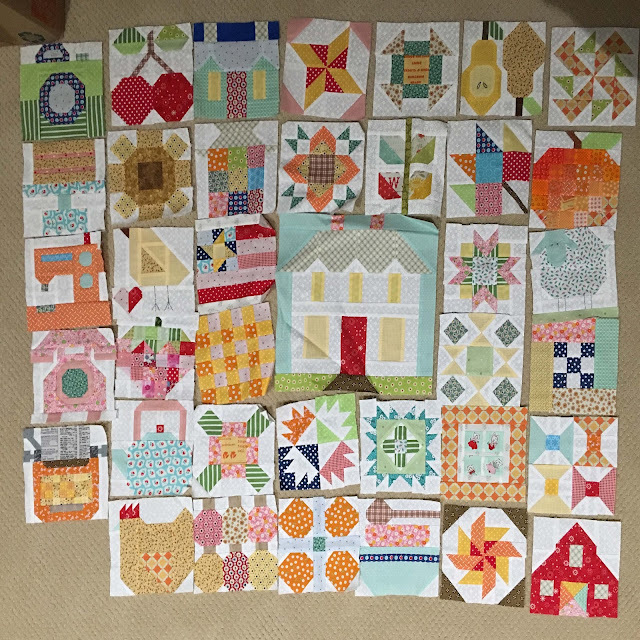 Did I mention that next year, the block of the month is going to be bird themed? I'm calling it "The Cloud Club," and, of course, I hope you'll be stitching along! The Flower Blocks are wrapping up, only one to go. We had some complaints that they are taking too long and for that I have no excuse, but we are almost there! 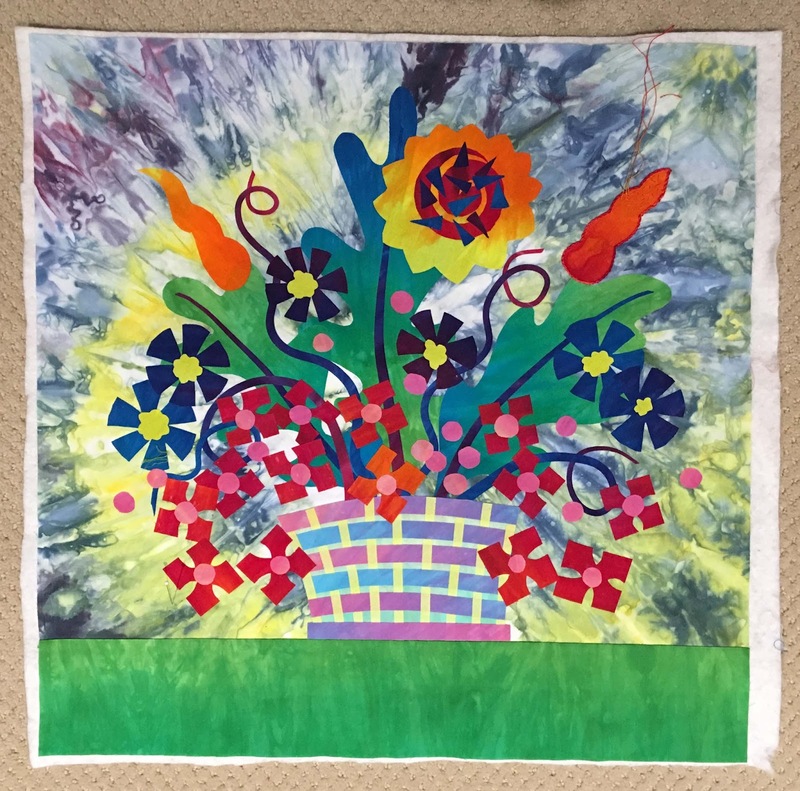 Creativity does not do well under pressure, and I really want this for next year's show quilt, so I can't let anything go until I am totally satisfied with it. It's a real point of pride to see all those blanks get filled in. 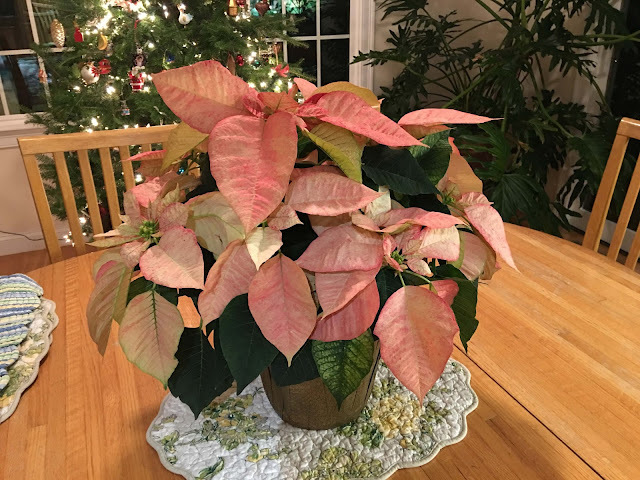 For December, the obvious choice is a poinsettia... but I have never been able to digitize one... just look at that-- pretty, but the flowers are really leaves and there's no organization to it. 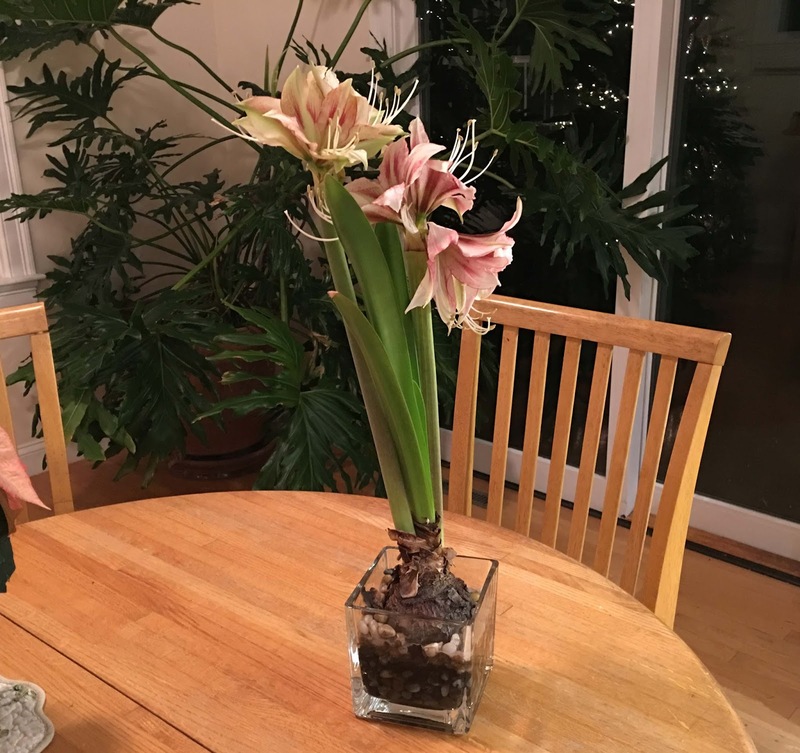 I LOVE amaryllis and try to grow one every year. This year's bloom was just smaller and not as colorful than usual, and how to you make it short to fit a quilt square? Tomorrow, I am going to buy the plant I finally decided on, and I'm going to keep you in suspense. You will, of course, love it... it's the perfect ending. Then it will be time to get all those setting triangles made in the early winter of 2018. I have GORGEOUS borders planned that are not going to require the precise placement like "A New England Album." Yes, my copy of the AQS magazine came in and there it is, just like a fairy tale! 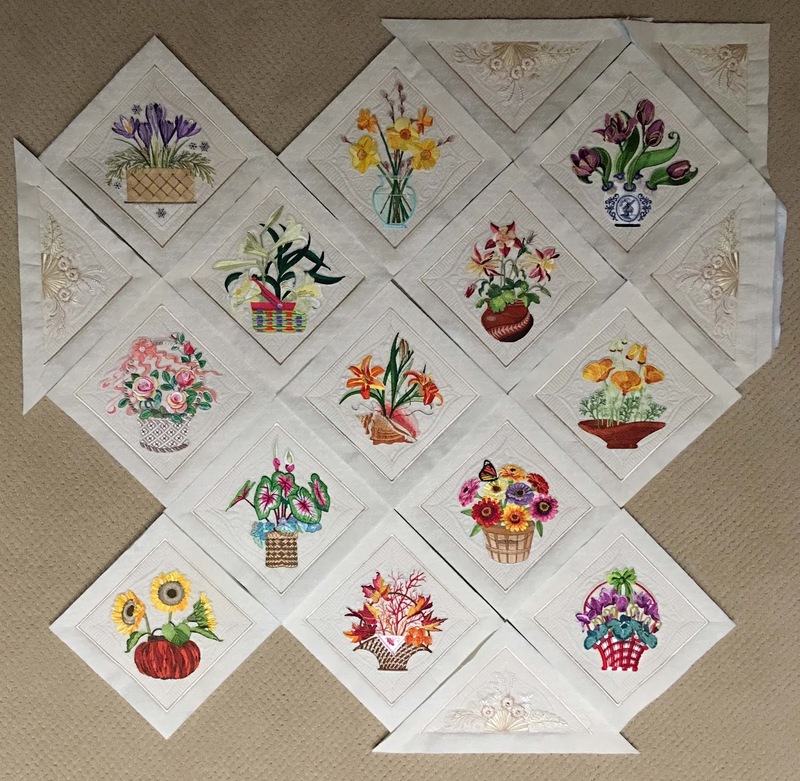 So to those of you who are impatient with the flower blocks, just try to have a little faith-- we are all going to cross that finish line again, together. Yes, that's me there! Speaking of monumental projects, while I was digging out Christmas ornaments, I found something we all thought was lost! 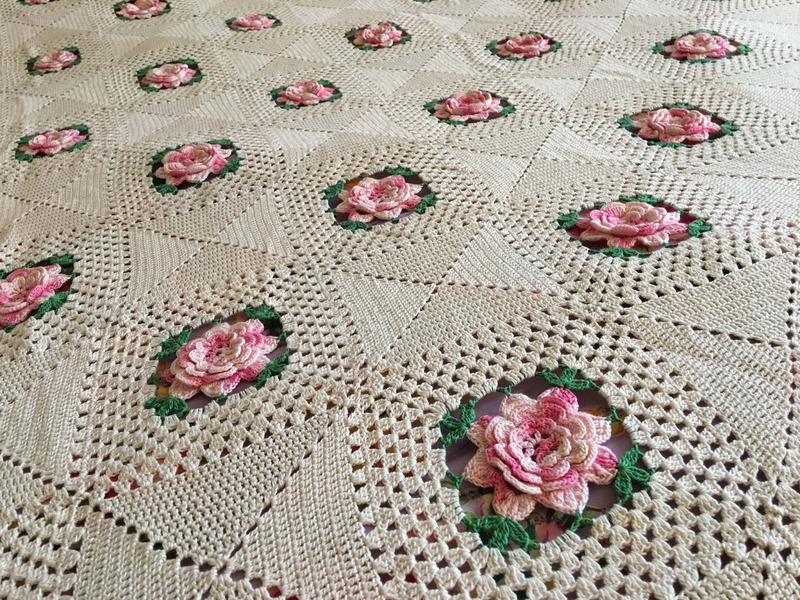 This is a "Rose Bower" bed spread my grandmother made for my sister years ago. How it got in my basement in a plastic bin with tax returns is anyone's guess, but it's been missing for years. There are 270 crocheted blocks, all beautifully sewn together and in absolutely perfect shape. Made me so happy to find it. My grandmother died when I was still very young, but obviously I inherited her love of the needle, and it was fun to study what kind of job she did! PERFECT. Here's one more thing... a little Christmas present I got for myself. (We all do that, don't we?) 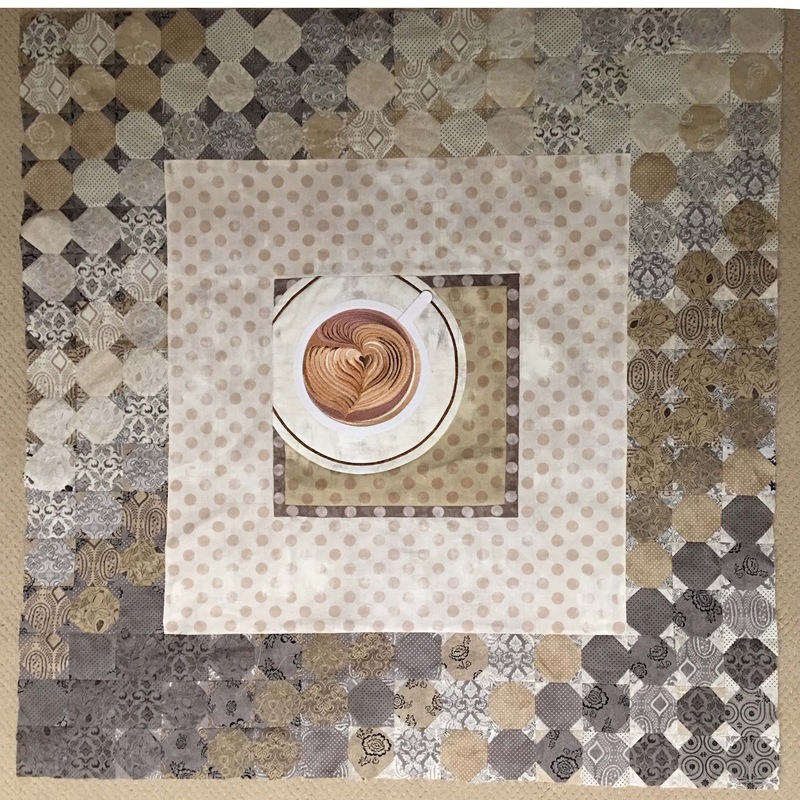 You know there are people out there who seem to make a quilt like every three days. How? This is a really interesting technique put out by the Fat Quarter Shop. 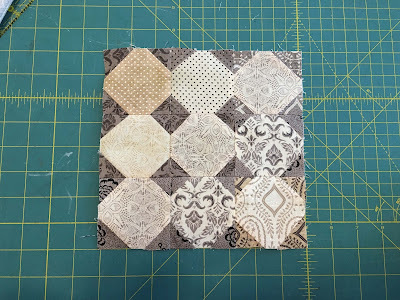 You just lay two 10" layer cake fabrics together with one of these papers, and just stitch on the lines, cut everything out, and use the pieces to assemble your block. There's a book with pictures of quilts on the left, and you need to buy the papers on the right. 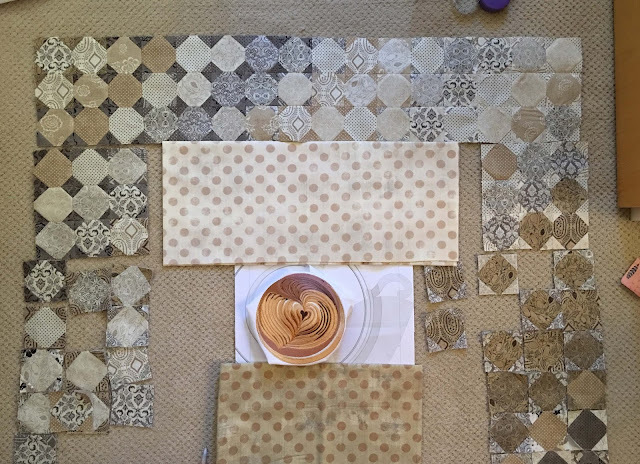 I was interested in the "Petit Four Quilt." Can you guess why? 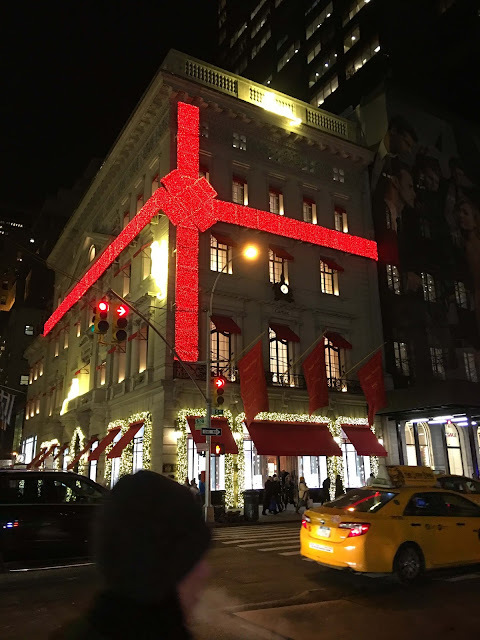 Because it has those white diamonds in the middle of every block that are just dying to have embroidery in them. 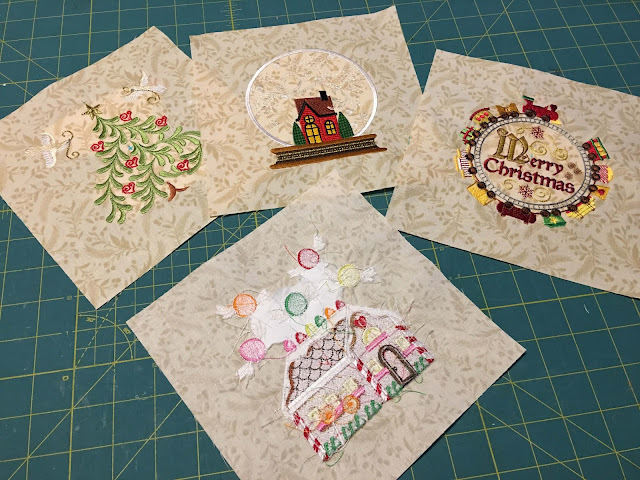 I'd love to make a quilt out of the "Countdown to Christmas" blocks next year and this seems like it would be a big help to do it. So that's just a tiny bit of what goes on here right now... the vast majority of it is in front of the computer these days. 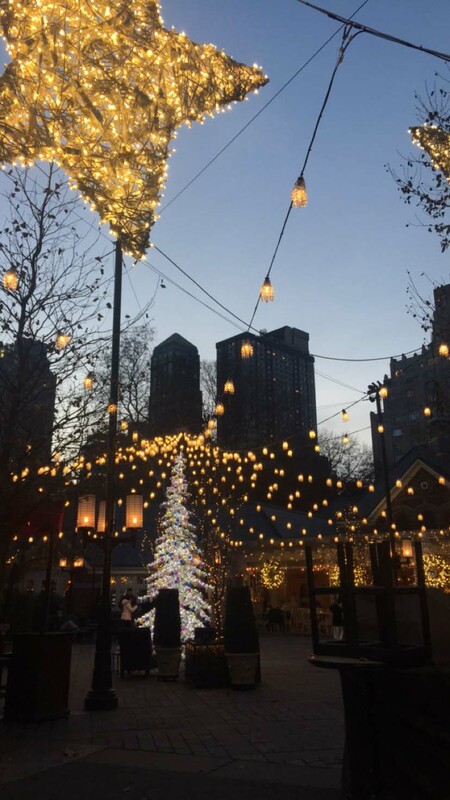 Hope you are having yourself a merry little Christmas, and enjoying the days leading up to it. Some of our most loyal fans know our secret... shhhhh. We are FROM San Francisco but currently located in Plymouth, Massachusetts. We hope that doesn't cause you shock and disappointment-- we're still in "the city by the bay." but it's been a case of "Bloom Where You're Planted" for us. And it does have its fun, especially on Thanksgiving Day! 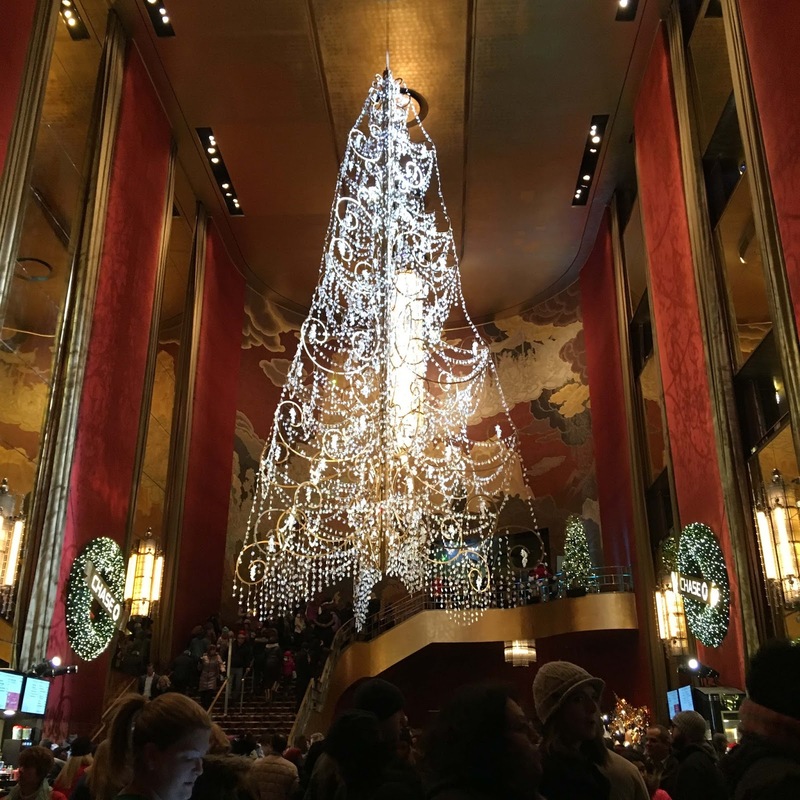 We actually made 7th on a list of "Most Overrated Places to Visit," even beating out the famous location below! 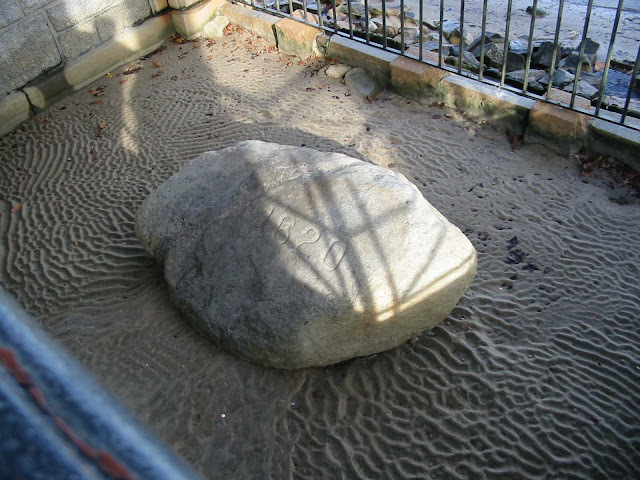 Yes, this is our claim to fame-- a rock! 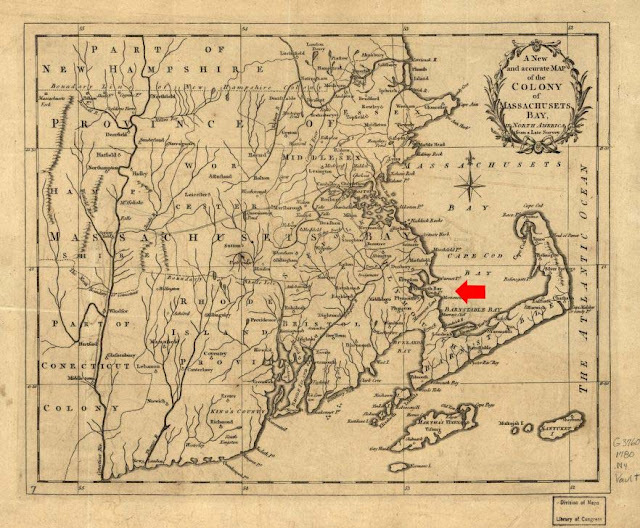 This is supposedly where the Pilgrims set foot when disembarking from the Mayflower. 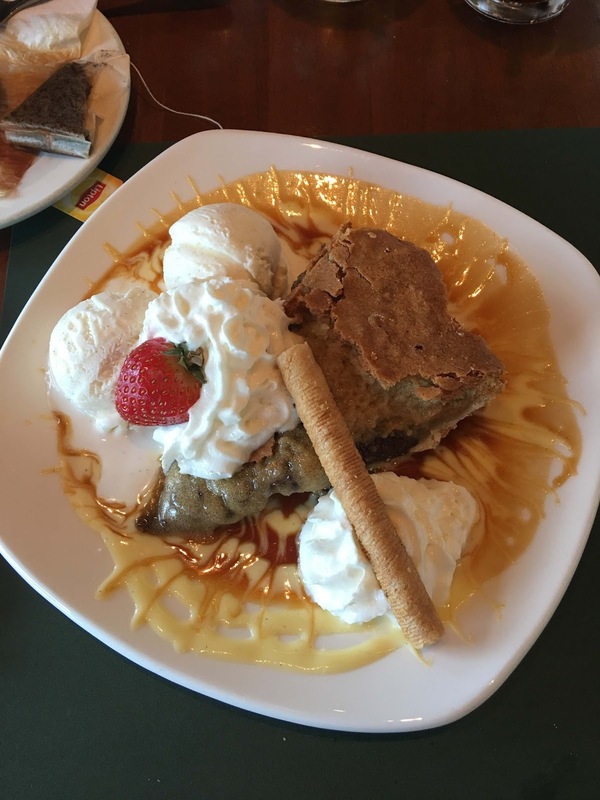 We're skeptical, but it does have its own history now. See that crack in the middle? 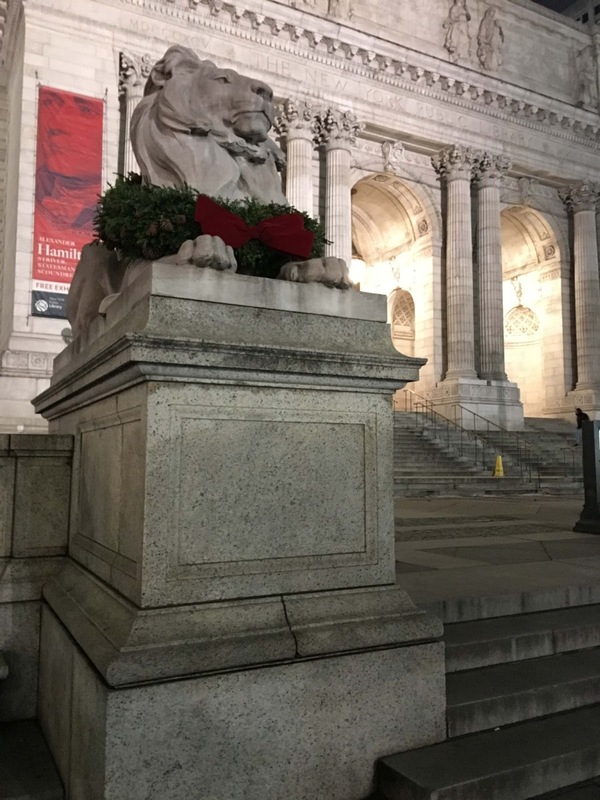 That happened when the British tried to forcibly take it away from the colonists, because it was a powerful symbol of freedom. I can just picture the two sides pulling on it like a tug of war, then having it split in half while everyone falls backwards! Truly, a great moment in history. It is currently enshrined in a monument on Water Street, to prevent tourists from chipping pieces off. 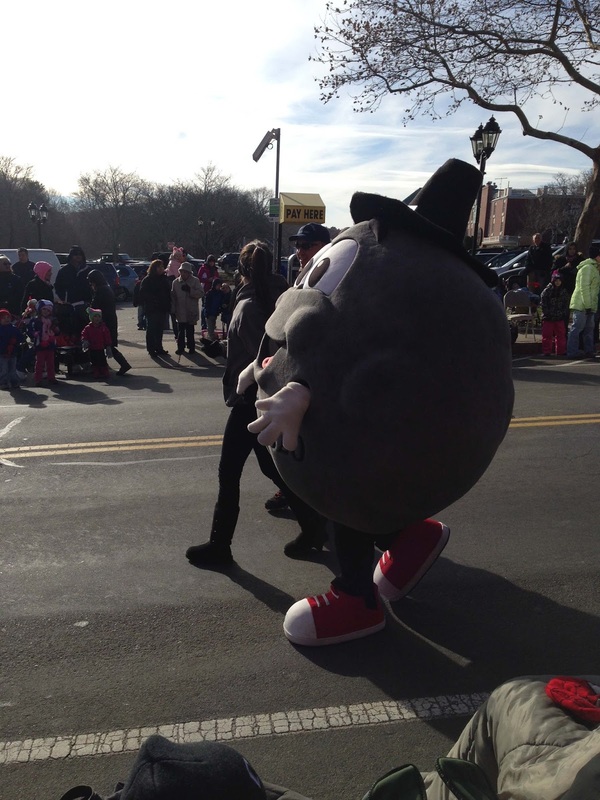 The Saturday before Thanksgiving, our Rock puts its red sneakers on, and they let it out of the cage for a parade. Now you don't see that at Macy's do you? it's the same meal, but always a little bit different circumstances for each one of us, year to year. We are having a quiet one with just the four of us. We sincerely hope wherever you may be, you have much to be thankful for today. after weeks of Indian summer, it dropped down to 28. So it is officially time to hunker down in our cabins! I treated myself to a little recreational sewing-- those of you who know me best, know I have my business which is sewing, and my hobby, sewing. 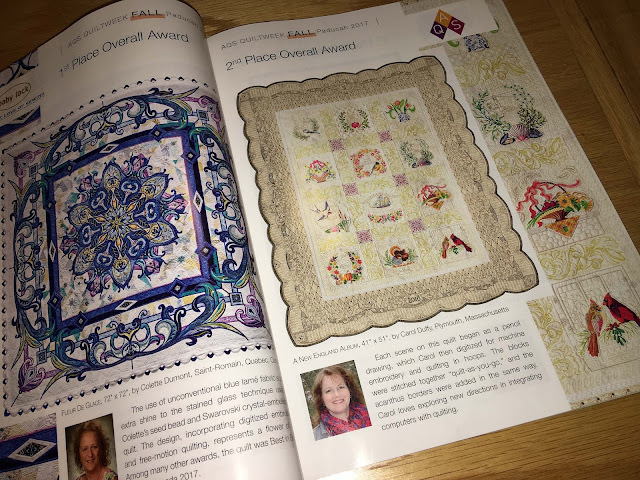 "Dot Zero" is definitely hobby sewing-- I'm planning on entering a challenge next year, and if it comes out the way I have it in my head, it will head to other shows too-- ones that have a "whimsical" category. The challenge is to use polka dot fabrics-- I really don't like polka dots and don't own any polka dot fabrics (except for my beloved grunge). But that didn't stop me-- I decided to make my own dot fabric by stitching together "snowballs," and, of course, embroidering dots. So 156 snowballs later, here's where we are. After thinking about it, there is one "dot" I really love, and that's the one that's going to be in the middle-- can you tell what it is? It's that spot I gaze into every morning. I always wanted to make a bigger piece with it, and the one I embroidered for "Dot Zero" is 7 inches wide. Don't ya wanna just wake up and smell it! I want this quilt to be beautifully pieced. 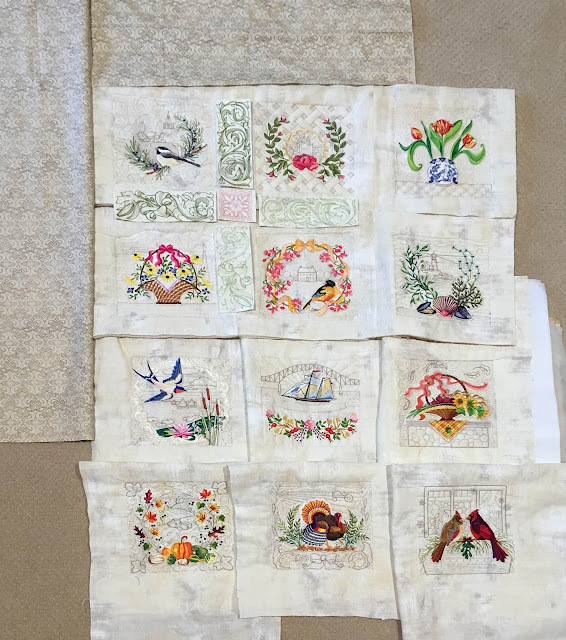 Most of my quilts are all about the embroidery, but I've been piecing for much longer than I have embroidering. Here's a couple of things I've learned. 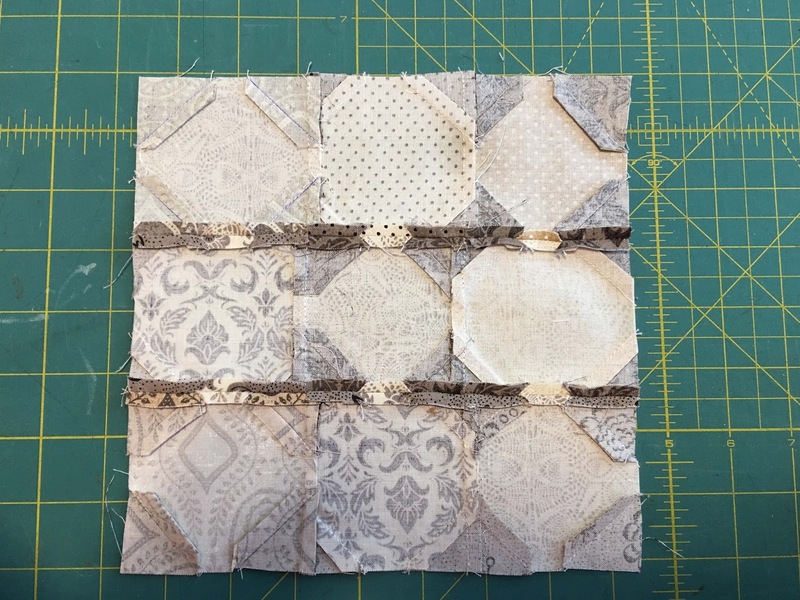 The key to great piecing is pressing your seams the right way. If you are buying a pattern and it doesn't have pressing diagrams, move on. For the snowball seams to "nest," you have to make "innies" and "outies" as shown with the seams above-- very much like belly buttons. Pinning and starch and two other great ingredients for perfect piecing. 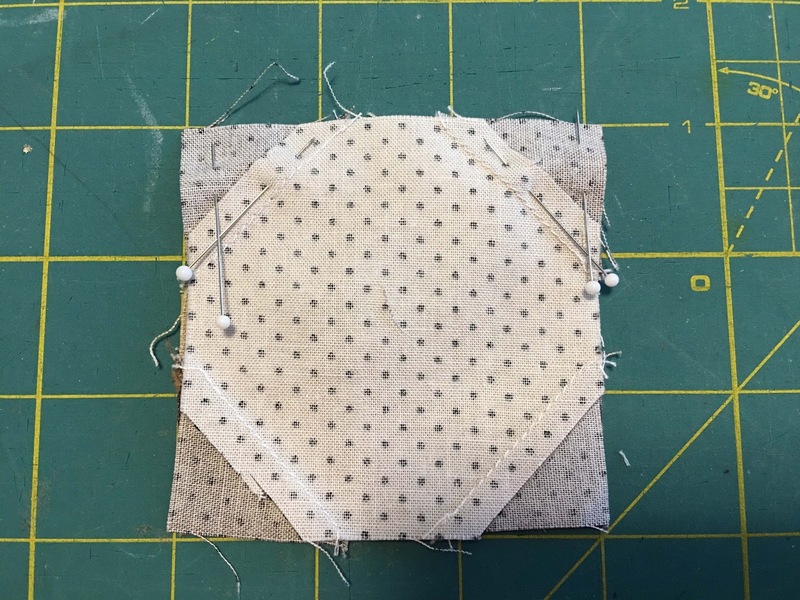 Sometimes when you pin, you are only looking at the top seam-- but you really need to look at the whole patch. That's why in the photograph above, it looks like just one patch is there-- but really there are two, perfectly placed on top of each other, paying attention to all four sides. You will be able to feel when the seams are in perfect alignment if you press correctly. I am making bigger blocks of nine. So once I have the rows together, I make sure the seams in alternate rows are pointing opposite ways. That insures the rows will also nest. Seams with a lot of fabric should be pressed open. So that's my homage to caffeine. After I have it sewn together, the quilting will all be drawn, digitized, and machine embroidered. 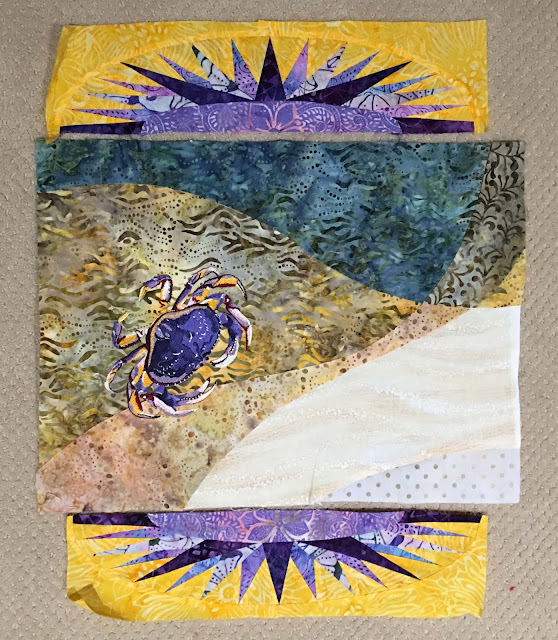 Quilting should be so much more than decoration-- it needs to add more to the story. So there's a few surprises still in store. I like to draw people in to my quilts, and if you look closely, you'll be rewarded!